One word we use to describe the salvation experience is "conversion." While driving, when you realize you're travelling in the wrong direction, you make a uTurn. Christian conversion is when you make a uTurn in your regard for Jesus. So, what does a converted life look like? A perfect place to look for an answer to that question is in the life of the Apostle Paul. In Acts 9, we find how God took a persecutor of Christians and made him a passionate Christian. Now, there are elements of Paul's conversion that are unrepeatable. Paul saw the risen Christ in a blinding flash of light and heard his audible voice. No one should expect that in their own conversion. But Paul's uTurn does serve as an example for us. In 1 Timothy 1:16, Paul wrote . . . I was shown mercy so that in me, the worst of sinners, Christ Jesus might display his unlimited patience as an example for those who would believe on him and receive eternal life. God's design in converting Paul was, in part, to give you hope for yourself and for the people you want to see converted. God had you in view when he saved Paul. That is an awesome thought! So, if Paul's conversion was meant as an example to us, what can we learn from Paul's conversion? We discover from Paul's uTurn that it involved a personal encounter with Jesus Christ, a desire to grow with others who've encountered Christ, and a passion to communicate Christ's claims to others. 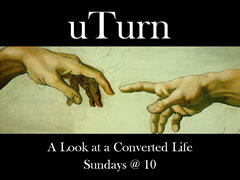 This Sunday we'll begin a series called uTurn: A Look at A Converted Life. We'll camp out in Acts 9 for three weeks and learn from the example of Paul's conversion. We'll see that Christ's work in us involves . . .
uTurn in relation to the world. You'll need extra motivation to show up the next three Sundays. This Sunday, we "spring forward" into Daylight Savings Time, and then the next two Sundays bookend Spring Break. It'll be harder to persuade your body to jump out of bed and get to church. But you'll want to join us for this fascinating study of the most famous conversion story of all time. Don't miss it! We start the series this Sunday at 10am!